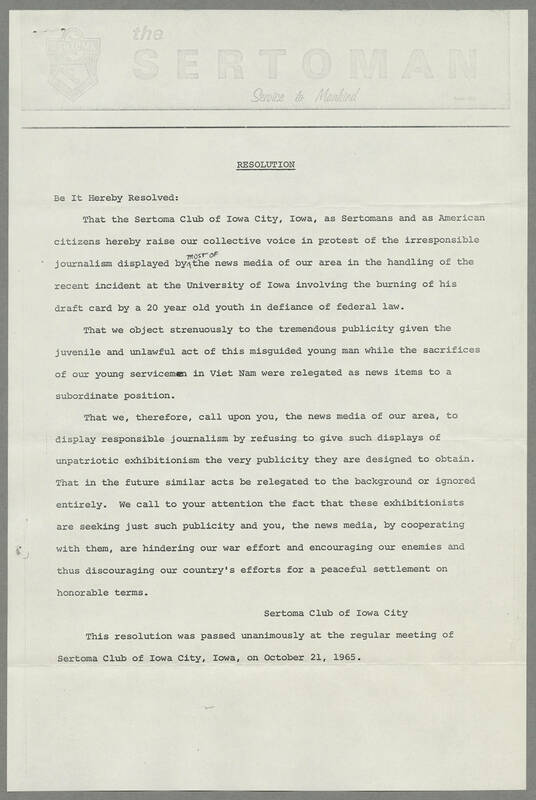 the SERTOMAN Service to Mankind Form 102 RESOLUTION ___________ Be It Hereby Resolved: That the Sertoma Club of Iowa City, Iowa, as Sertomans and as American citizens hereby raise our collective voice in protest of the irresponsible journalism displayed by most of the news media of our area in the handling of the recent incident at the University of Iowa involving the burning of his draft card by a 20 year old youth in defiance of federal law. That we object strenuously to the tremendous publicity given the juvenile and unlawful act of this misguided young man while the sacrifices of our young servicemen in Viet Nam were relegated as news items to a subordinate position. That we, therefore, call upon you, the news media of our area, to display responsible journalism by refusing to give such displays of unpatriotic exhibitionism the very publicity they are designed to obtain. That in the future similar acts be relegated to the background or ignored entirely. We call to your attention the fact that these exhibitionists are seeking just such publicity and you, the news media, by cooperating with them, are hindering our war effort and encouraging our enemies and thus discouraging our country's efforts for a peaceful settlement on honorable terms. Sertoma Club of Iowa City This resolution was passed unanimously at the regular meeting of Sertoma Club of Iowa City, Iowa, on October 21, 1965.